What were initially thought to be just a couple of brilliant, closely spaced features at one location now turn out to be a clutch of many smaller dots. 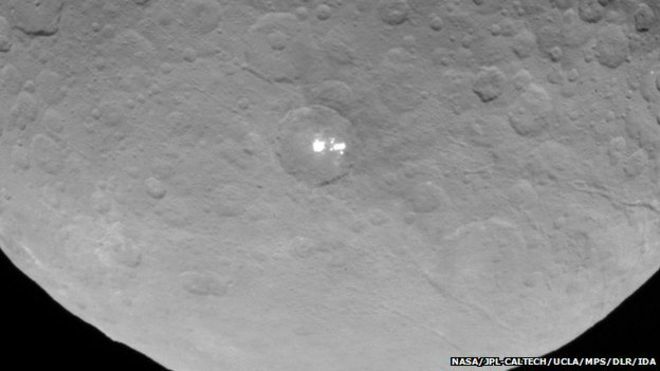 The latest pictures were acquired by the US space agency's Dawn spacecraft on its first full science orbit since arriving at Ceres on 6 March. The spots were seen from a distance of 13,600km. Researchers on the mission concede they still have much to learn about the dots' true nature, but the new data is hardening their ideas. ufosightingsdaily.com claims there are UFOs watching and can be seen above the spots. See video bellow!